Cat® longwall plow systems and armoured face conveyors have proven themselves by efficiently producing millions of tonnes of coal in mines around the world. Much of that coal has been produced using conveyors equipped with controlled start transmission (CST) technology, which allows soft or abrupt start through the use of motor stalling torque. This technology also has helped plow systems achieve production rates up to 20 000 tpd. "Cat® inverter-equipped drives boost longwall face conveyor and plow performance"
More recently, frequency inverter-equipped drives, also knows as variable frequency drives (VFD) have come into use and are demonstrating their capabilities compared to conventional drives. Variable speeds and precise torques are available without the use of special motors, and active braking of motors takes place via energy recovery. Also, improved overload protection for the drives protects system components, and separate positioning of drive motors and inverters saves space at the ends of the face. Caterpillar measured differences between conventional and variable frequency drive technology on the basis of simulations and measurements in the field. The advantage of virtual scenarios is the ability to try new concepts and then observe the expected system responses. Analysis of dynamic processes under selected operating conditions (abrupt starts, blockage, variable process forces, overload) provides key insights. Most commonly, asynchronous motors with squirrel cage rotors plus Cat UEL overload gearboxes are used for longwall plow drives, while gearboxes with CST technology are used for the conveyor. In recent years, inverter-fed drives have been finding increased use due to the good control characteristics. Caterpillar simulated a plow system for a 250-meter-long face and the associated armoured face conveyor. Verification of the model used is based on measurements taken in operating longwall systems. The simulation model used represents the entirety of the plow system and a conveyor. Like the real system, the model is divided into individual components: motors, possibly a frequency inverter, gearboxes, chain sprockets and chain. To observe the dynamics of the chain, a chain strand is divided into discrete individual point masses that are connected by spring and damping elements, which reflect the elastic properties of real chains. In addition to the mechanical parts, the sub-model of the gearbox contains a hydraulic part that controls the clutch installed in the gearbox. 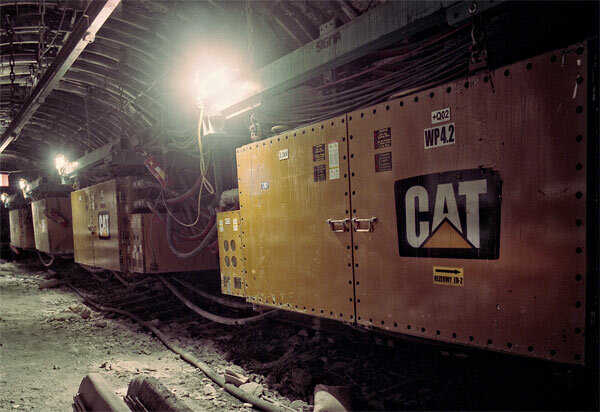 A conventional Cat longwall face conveyor uses CST gearboxes and asynchronous motors connected directly to the mains. The starting process proceeds first with the electric motors accelerating to their nominal speed with the CST clutch open, and then the conveyor is brought into motion through targeted engaging of the clutches. This procedure enables exploiting the breakdown torque of the motors to accelerate the conveyor. The gearboxes operate with continuous slip of about 0.2%, which is varied within limits by a load-balancing controller. This control approach uniformly distributes the load to both drives. Frequency inverter technology offers a new control approach in which need-based distribution of the existing load protects the conveyor chain. With conventional, uniform load distribution, the tail gate assists the head gate by pulling its portion of the load indirectly via the chain sprocket of the head gate. This results in an inappropriate load on the chain and chain sprocket. In contrast, need-based load distribution enables each drive to handle the directly associated load. If and when the head gate drive can no longer handle its portion of the load alone, then the tail gate provides assistance. Through use of this control concept, the amount of force present in the bottom race of the chain decreases and indirect pulling via the chain wheel is minimised, which has a positive effect on the service life of the components. It is obvious that this can also be applied to the plow system, where no control is provided by conventional technology. On a conventional conveyor, the power curves for the head gate and tail gate are almost identical. The two drives share the entire load in a ratio of 1:1 regardless of sudden load increases. On an inverter-fed conveyor, the head gate provides more power when the load is low and the tail gate drive contributes more heavily when the load is higher. When the load is stable, the head gate again provides the greater drive power. Drives equipped with frequency inverter technology offer advantages. Being able to specify a variable speed and/or a defined torque permits new control approaches for the entire system, such as controlling the plow and conveyor for optimal loading or improved load balancing between the drives. Having the ability to brake the plow by actively feeding electrical energy back into the grid also protects the system components. 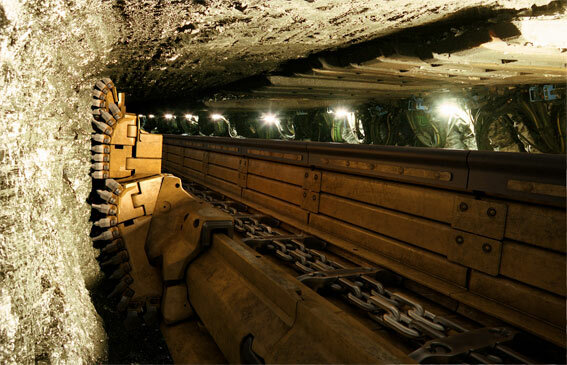 Additionally, when the drives are started, the electrical system of the mine is not subjected to even greater loads. Even weaker electrical supply systems can increase performance with inverter technology.